Tyler again from the Deckpoint Studio team. I’m writing today to provide an update on a couple of action-packed months for Luckless Seven. We’re well into what has unofficially become expo season for Luckless Seven. Late in August, we attended our first Matsuricon, a Columbus, OH anime convention. Then, last weekend, we attended GDEX, a regional game development expo, for the third consecutive year. The new start menu better showcases Luckless Seven's gameplay and better hides Mark's freaky fingers. The approaching expos made a good occasion to review feedback from last year’s GDEX and measure today’s game against the Luckless Seven of a year ago. We’re thrilled about our progress over the last year, but we still wanted to make sure we’d adequately responded to the player feedback. A common theme amongst players was a desire for context and clarity in the game’s introduction. Who’s this werewolf? Who are these characters? And, even more generally, what kind of game is this? Colorful lights and sounds filled the arcade room at Matsuricon. These concerns melded with our team’s recent desire to make the start menu more representative of the in-game world. So, we’ve taken the first-person, moving/rotating camera, and replaced it with a perspective just like that of the overworld. Throw in a few particle effects, and we think it looks pretty nice! With the start menu adjusted to look just like a scene from gameplay, we got the idea to make it act like a scene from gameplay. Now, when you click to start the story, a short dialogue scene between Krista and Mark plays. We showcase some of the characters and foreshadow some of the story as a way of lending context to new players. And then, after this scene, the werewolf Ekosi battle ensues as normal. The old start menu truly reveals Mark's monstrous hands. The story begins in medias res. Between Matsuricon and GDEX, we had plenty of player help to identify areas for improvement. A number of players experienced difficulty navigating Krista’s house on Day 1. The Mystery Girl at the Library presented a number of Ekosi AI issues. Then, a number of players expressed confusion or disinterest in the post-battle report. Additionally, many players reported a lack of connection between Ekosi matches and the overworld. Closed garage door (a common player misstep). Added signage and observation icon to guide the player. Made a wall transparent to better reveal the walkway. The report now shows currency reward.Players can now receive Ekosi cards upon victory. Added collectible items to the overworld. Some new decor guides players around Krista's house. Pool party in the back! We were even able to get some feedback on the new opening dialogue. Accordingly, we have plans to make the dialogue more robust to provide additional narrative context. This time of year is a pleasant reminder of the value of playtesting. 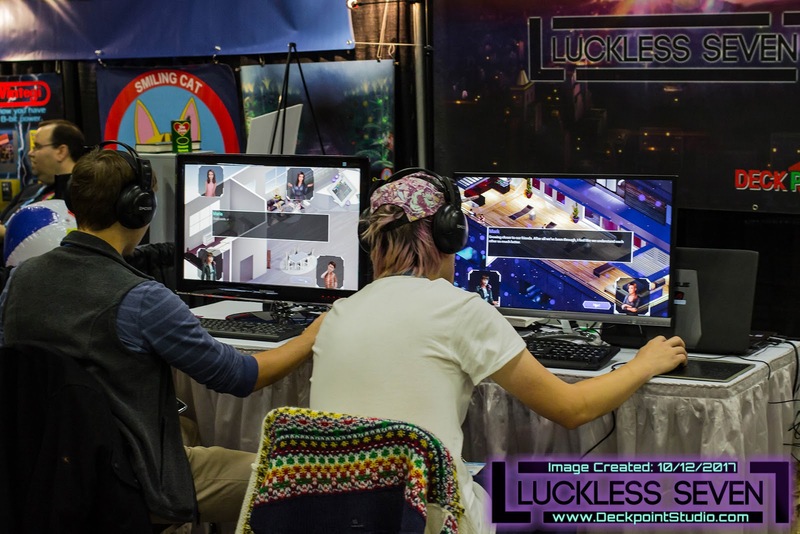 If you haven’t played the game in a while, now is a great time to revisit Luckless Seven. We’d love to hear what you think! We’re continuing to work on enhancements to the game, and we’re eager to show it off at other opportunities in the coming months. See you next year, Matsuricon! Thanks to everyone that joined us at GDEX this year!